Power, control and precision - for an impressive film and music experience. Enjoy your favorite movies or concert recordings in multi-channel technology, with a seemingly limitless dynamic and a natural feel that causes goosebumps. You will never forget images from the most famous movies - and with this amplifier, you will no longer be able to get the sound of these masterpieces out of your head. The No.33 Cineast three-channel amplifier is stunningly lifelike. With the power and natural feel that high-end stereo enthusiasts are already familiar with in the stereo version of this amplifier. 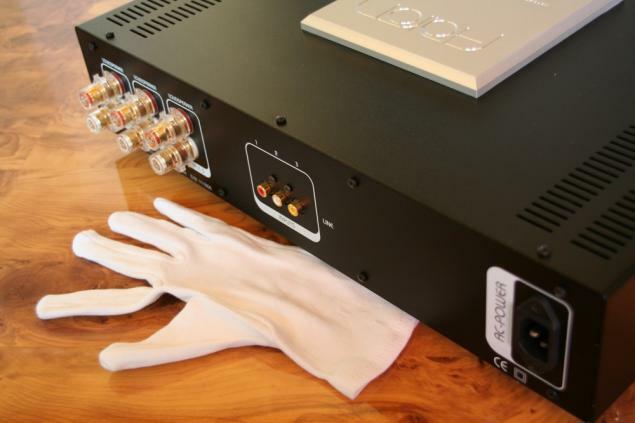 Of course, our No.33 Cineast three-channel amplifier is also equipped with high-quality mono power modules. Channel selected components and a very generous power supply adapted to three output channels equally ensures a high-definition, natural and always realistic-looking playback. Dynamic jumps, such as those occurring in the dramaturgy of exhilarating film sequences and also in live concert recordings, are portrayed by the No.33 Cineast Amplifier with brilliance and accuracy. Whatever you always want to see and hear – concert recordings, beautiful movies, exciting blockbusters – this amplifier will give it to you in an impressive manner. Our sales representatives will happily demonstrate the amazing capabilities of this three-channel amplifier for you. On your speakers, and also very gladly with you at home. Of course, the No.33 Cineast Amplifier is available with our high-end satisfaction guarantee. If you are interested in the technical data of this three-channel amplifier in addition to the sonic capabilities, you can request a data sheet as PDF file. The No.33 Cineast Amplifier is available in a silver-colored "Aaron Silver" version or with a black front flap in the version called "Night Shadow" from EUR 3.990,- Our current AARON price list is available for download as a PDF file. We wish you many hours of pleasure, music enjoyment and great cinematic experiences with your new AARON amplifier. For more information and also on the subject of our “High-End Financing Service“, you can contact us at any time. See you soon – in the circles of satisfied AARON owners.